I am in love with this round of decks. Sweet, swooning, head-over-heels-and-then-around-again love. I know I’m going to buy at least one deck, and if you wanted to try them all I wouldn’t blame you. We know the decklists and the values, and frankly, there’s nothing in the decks that compels an immediate buy. Right now, Kess, Dissident Mage is the most valuable card of them all, with Teferi’s Protection goosing the value of the Vampire deck as a close second. Mirari’s Wake is the most expensive card in the Cat deck, a not-that-surprising inclusion given that it’s GW. Today I want to look at where some of these prices are headed. Right now, we are a week away from getting the decks in hand, and it’s time to look at what singles look spicy. Before I get into the specific cards, I want to take a moment and say that not all reprinted cards will tank in value. Mirari’s Wake, for instance, has had several printings, though not one as common as this one. Judgment, Commander’s Arsenal, a Pro Tour promo, being a mythic in the first Conspiracy…none of these were common but neither are they rare. Adding to this is that if you buy the Cat deck, this would be one of the last things you give up if you’re going to play the tribal colors. As a result, I don’t think too many copies of this are going to go into circulation. I like picking up Wake in the $7 range, don’t go to $10 unless you’re going to play it. With the original at $15 there’s not a lot of room to grow at that point. Leonin Arbiter will be a great spec if you can get in under $3, but again, the original is $5. The good news is that it’s a four-of in the assorted Taxes builds in Modern, and with Modern Pro Tours coming back, this might hit a big spike as it turns off fetchlands on camera. Traverse the Outlands is currently my favorite target from this deck. It’s going for under $3, and it synergizes with a lot of the cards you’d want to play in a ramp deck. I also like that it’ll push people to play more basics. I have to admit, all of the reprints are cheap enough that I don’t like picking any up for long-term value. This second reprint of Black Market is probably going to keep the value held down for a long while. Heirloom Blade is in two decks and while it seems tempting, the creature revealed just goes to your hand. There’s better options. The new Vampire legends are intriguing, but I think people are overrating Mathas, Fiend Seeker. I’m really hoping that people aren’t buying him in anticipation of doing a Leovold on us. 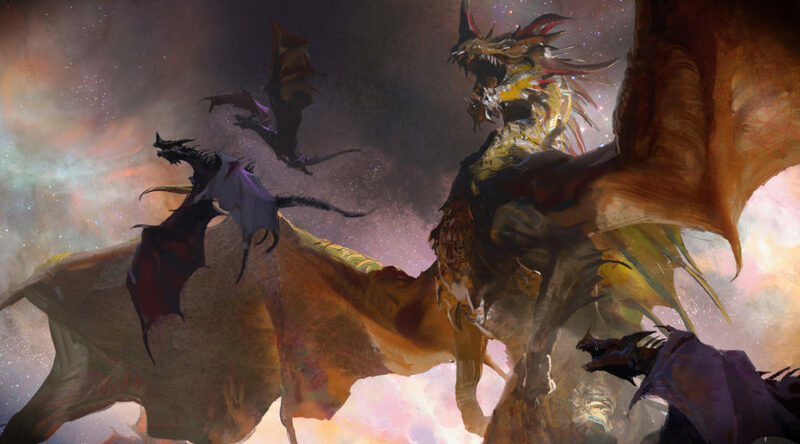 Mardu isn’t a popular color combination in Legacy, and getting value from him requires the creature dying in a format where Swords to Plowshares gets a lot of play. Don’t fall for this. Teferi’s Protection is an amusing card, and yes, it’s a great answer to a lot of things. The token rules are even getting rewritten thanks to this card, and if that means you want to go crazy with Teferi’s Veil, be my guest. I would be shocked if this stays at $15, and I think the $10 range is more likely once the initial wave calms down. The reprinted dragons are all amazing and the sheer number of legends makes Day of Destiny awfully appealing. Go get yourself some Dragon Whelp or Dragon Hatchling so you’ve got more to do in the early turns. I especially love both Dragon cost reducers being included here. I think this deck has some really intriguing cards for the future. Mirror of the Forebears is kinda lame in this deck, given the number of legends, but it’s exactly the sort of broken thing you want in a lot of tribal decks. Play your awesome card and then copy it for a single mana! It’s at $3 now but I will be looking for this at $2 or less for the long term gains. Curse of Verbosity is close to my favorite card in all the decks. It’s a fantastic way to draw a target on someone’s head, and while I appreciate the people trying to jam this in Legacy, I just don’t see it happening. It can be had for a buck right now, and that’s too low. This will be at least $3 and more likely $5 in a year, even if it is in two decks. People are going to see how fun it is and want more. Kindred Discovery is amazeballs and I’m shocked that it’s only in one deck. It seems like such a great fit for Wizards too, but as a result of being the singleton, it’s at $3 now and that price is not going to hold. This is going to at least double by Christmas 2018. The reprints here aren’t too exciting. This is going to torpedo the prices on Nin, the Pain Artist, and Marchesa, the Black Rose. Those two had been low-priced due to supply, not demand. Yet another round of copies on Chaos Warp. Decree of Pain will now be $3 forever. The new cards are causing all sorts of hype and I’m very skeptical. Mairsil, the Pretender is just right when $7-$10. Kess, Dissident Mage is possibly Legacy playable, but four mana is a lot in that format. People don’t run more than 2-3 of Jace, the Mind Sculptor, and so Kess is going to have to get played and immediately flash back a Gitaxian Probe for value. Will some people try her as a one-of? Sure, but I think Leovold’s specter is pushing her price. I’m terrified of Galecaster Colossus, but reassured that it’s nonlands only. I think Kindred Dominance is perfect at $3 for a long, long time. It’s only good in black tribal decks, so don’t go crazy. Finally, the best land in a long time: Path of Ancestry. Thank goodness it’s in all four, because this is a card that tribal decks are hungry for. Scry 1 is amazingly good when you can do it turn after turn, and it’s preselling in the $3 range. I don’t think it stays there for long, and I advocate getting all you can under $5. There are just too many decks that want this card, and spare copies won’t stay available for long. Once Magic players and their money move on to Ixalan in a couple of weeks (seriously, preview season in early September) it seems unlikely that stores are going to crack a lot of inventory for singles. Bonus card: Stranglehold has dipped to the $10 range after being reprinted in Commander Anthology. This is a card that a lot more decks should be playing, frankly, and I don’t know why Wizards doesn’t want to reprint such an effective card. If you need it, get it while it’s cheap and you can shut down everyone else at the table. It’s already in 3000 EDHREC decks, and I enjoy this card immensely too. Cliff is swinging the pendulum back towards Commander, given the new and exciting cards they keep printing for the format, but any new format or odd way to play will always get his attention. Read his articles every Friday here or hit him up on Twitter @WordOfCommander. You again demonstrate that your ideas are not worthy of being behind the paywall. Many of the points can be found in reddit/mtgfinance, EDHRec, and plenty of other public MTG sites that touch on EDH. The content that could *possibly* be exclusive is nonsensical at best, as your reasoning cannot be followed at all. If you actually paid attention to the cogent points of the reasons why EDH people are pursuing current price trends (like Jason Alt does), then you would be writing a different article. I’m not only talking about your EDH articles, but of your past substandard articles (Standard, Cardsphere, and Hour of Devastation to name a few). Once again, get some MAJOR proofreading/second opinions before you release the articles, or ask to have your articles be free. Again, both options would benefit the (currently floundering) site. You keep being FAR off the mark for your articles to be worth any monetary value to read, and it’s articles in this that are rapidly causing me to lose my low confidence on this site.